The Vancouver Metro Soccer League’s (VMSL) dominance of this year’s BC Provincial A Cup continued on Saturday with two more teams joining Friday night’s winners Croatia SC in next week’s semi finals. Croatia will now travel to take on Inter FC after the Imperial Cup winners continued their fine recent cup form with a hard fought 3-2 win over FVSL side Westcoast Selects. They needed extra time to do it and in the end Inter found a way through thanks to three goals straight from free kicks. Westcoast shocked their hosts by taking the lead after just ten minutes. Cole Almond was played in and he finished high into the net, giving Inter keeper Erman Ozkan little chance. The visitors had a chance to double their lead ten minutes later when Dave Sambol broke clear and bore down on goal but he hit his shot straight at Ozkan’s face. The keeper stood firm, kept the ball out but needed treatment after the danger was cleared. It was to prove to be a costly miss for Westcoast. Inter turned up the pressure and were having the lion’s share of possession. They won a free kick with ten minutes of the half remaining and Brian Van Schagen stepped up to curl it home and tie things up. Inter kept pushing and as the 45 minute mark came up, Tino Cucca was just unable to bring down a floated ball into the box and hit his shot into the arms of Westcoast keeper Alex Andrews. There was still time for Inter’s Kam Amini to whizz a shot narrowly wide in stoppage time, but Westcoast held firm and went in at the half level. There was little of note from either side to start off the second half but Inter took the lead in the 57th minute from another curling free kick. Once again it was Van Schagen who did the damage but Andrew’s positioning looked like it could be better as he seemed to have his view completely blocked by the wall. Westcoast pushed hard for the equaliser without creating any clear cut chances and Inter were looking quite comfortable with the lead. It was a lead they should have extended with then minutes remaining when Cristian Tropeano ran at the Westcoast defence and cut a perfect ball across goal but for no takers. Inter kept the danger in the box but the move ended with the referee being bowled over after an accidental collision. Joseph Marrello then had a chance to secure the win late on but Andrews saved low to keep his side in the match. As the game entered stoppage time, Westcoast weren’t going to give up and they grabbed an equaliser with the last attack of the match with just seconds remaining. The move started on the edge of the Westcoast box as the ball was played out to Paul Piche who saw space for Daniel LePage to run into up the right wing and played a great weighted ball for him to chase down. LePage took it to the edge of the box before delivering an inch perfect cross for Almond, who ran in unmarked at the back post, to head home his and Westcoast’s second of the game, sending the match into extra time. The goal reinvigorated Westcoast and they looked the team most likely at the start of the extra 30, with their pace causing problems for a tiring Inter defence. They couldn’t capitalise on it though and LePage missed a great chance to give the FVSL side back the lead when he pulled his shot wide left. Inter stormed back and Cucca looked like he had scored with three minutes of the first period of extra time remaining, but his shot was scrambled off the line at the last second by Graham Thompson. The Imperial Cup champions scored what was to prove to be the winner moments later though and it came from a third free kick. This one was out on the right and as Cucca played it low into the six yard box, it was missed by everyone and went straight into the net. Westcoast pushed for another equaliser in the second half of extra time and were leaving gaps at the back. Marrello should have put the game away in the closing minutes when he ran in on goal through two defenders but pulled his shot wide right with the goal gaping. And that was to be it. A hard fought battle to set up an all VMSL semi final with Croatia SC next weekend (you can see our report and video from Croatia’s win over West Van HERE). You can see video of three of the goals below, but unfortunately not the opener or the winner. 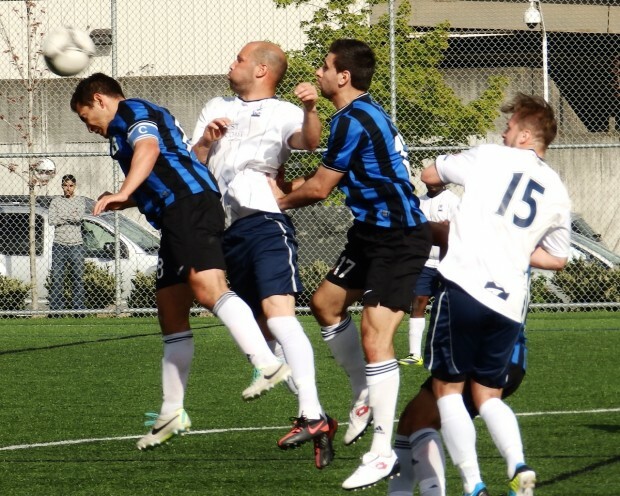 Two time defending Champions Surrey United Firefighters continued to make it hard for themselves on the road to the threepeat with a narrow 2-1 win over FVSL Premier runners-up Langley United on Saturday evening. Surrey went in at the half with a 1-0 lead when Angus Burke turned in a cross from the right but Langley levelled things up midway through the second half with a 35 yard strike from Mitchell Rohla that sailed over the keeper’s head and into the back of the net. The Firefighters finished normal time with ten men following a straight red but the numbers were levelled up in extra time when Langley also had a player sent off. Surrey won the match with just over five minutes to go after Langley’s keeper spilled the ball and Sean Einarsson was on hand to poke home the winner and send the defending champs into the last four. In the evening’s B Cup clash, Richmond Athletics made it two RSSA sides in the semi finals with a 2-0 win over Langley United Sparta. They will now host the winners of Sunday’s all Burnaby clash between Bacardi FC and BMSA champions South Burnaby Fighting Irish.